Carlton youngster Jack Silvagni embarks on a journey of exploration to learn more about his great-grandfather, Giacomo. Carlton star Darcy Vescio embarks on a journey of exploration to Hong Kong and Italy to trace her family roots. Loyal. Ageless. Humble. A warrior and champion of our footy club. Virgin Australia presents the inspiring story behind Kade Simpson's journey to the Blues' illustrious 300 Club. Season 2 | Episode 6. In the sixth episode of Season 2 of The Journey, go behind-the-scenes for history lessons, a long-awaited debut and a heartfelt goodbye. 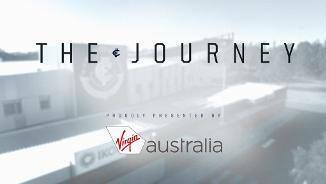 Presented by Virgin Australia.